Creations is looking for people that want any kind of arts or craft classes. Classes requested by Creations visitors include: parents and their children; children of all ages; women's groups; seniors; grandparent/grandchild; special needs etc. You could teach one time classes and workshops that vary by season and theme or you could commit to a weekly class. Creations' could plan the art class for you to teach or you could bring your own craft idea. Creations provides the art studio and art and craft supplies. 2-5 hours a month or more! We need volunteers that we can count on and will follow through when they commit to teaching an arts and craft class or workshop. 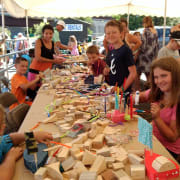 Come have fun creating art at Creations with a variety of students!